Oz is participating in a Chewy.com 30-day food challenge. 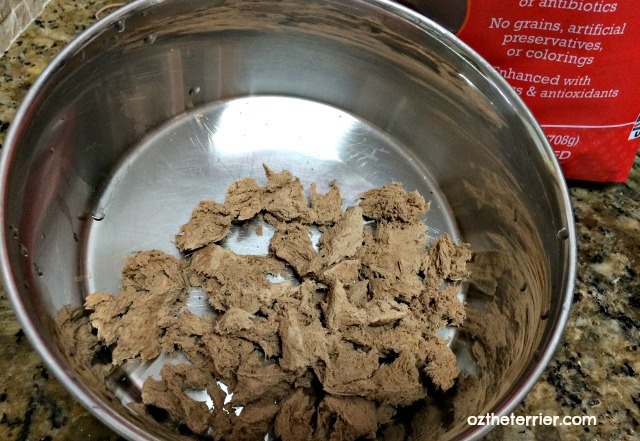 I received Stella & Chewy’s raw diets for dogs for free but I received no other compensation. Chewy.com and Stella & Chewy’s are not responsible for the content of this article. 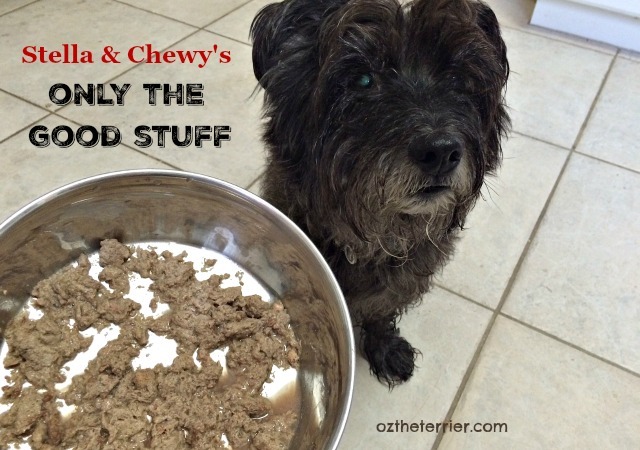 Stella & Chewy’s freeze dried raw dinners have been in Oz’s meal rotation for some time. It has been especially good for traveling and camping when I cannot safely provide Oz with his fresh-frozen raw dinners. This month, Oz has been eating Stella’s Super Beef freeze-dried dinner patties as part of his 30-day challenge. As you can see from the ingredient list, Stella & Chewy’s raw dinners are BARF (Biologically Appropriate Raw Food) style meals because they contain fruits and vegetables. The dinners also contain the correct ratios of protein, offal (organ meat) and bone to make a complete meal for your dog. The dinners are also fortified with added vitamins and minerals and enhanced with probiotics and antioxidants. Now, I know some of you told us on our last Stella & Chewy’s post that the one thing you didn’t like was waiting for the freeze dried patties to rehydrate. I can only guess that comes from our kibble-fed friends and yes, freeze dried raw does take a bit longer to prepare than kibble. But, we can honestly say that in our experience with several brands of freeze dried dinners for dogs, Stella & Chewy’s patties take the least amount of time to prepare! To quicken the prep time, make sure you crumble the patties into bite sized pieces before adding warm water. And yes, with Stella & Chewy’s you can add tepid or warm water (some other brands recommend cold water which takes longer) which we find speeds up the preparation. As soon as I add the warm water, I stir and press the patty pieces into the water to hasten the rehydration process. It takes me less than 5 minutes so Oz never has to wait long for his Stella’s Super Beef. 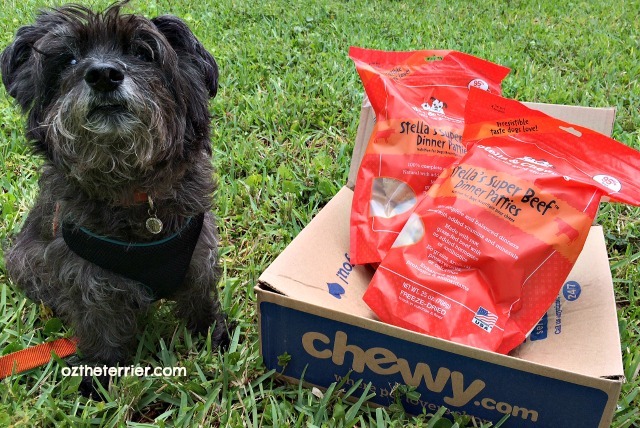 We still have another week to go in our 30-day Stella & Chewy’s challenge. I know Oz is looking forward to more delicious, healthy meals of Stella’s Super Beef. Be sure to check in with us in early July for our challenge wrap up post. 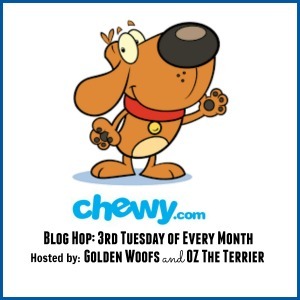 Oz the Terrier is happy to co-host the Chewy.com blog hop with good friend Sugar the Golden Retriever. Oh i wants to move in wiv you and help wiv the taste tasting! Scratching my head about how to link Purrseidon and Saphera's reviews. I see where to get the link to paste into their reviews, but not where to add their links .... will check back later. We have been using warm water to soften our patties too. Lightning is doing the food challenge and really loves his chicken patties. Mom just wishes she could find a good reference for how to use it to supplement his kibble without giving him too much or too little. He is too big to use the guidelines on the bag. Sounds like a good food to enjoy! Bentley and Pierre will be hanging near the Stella & Chewy booth at BlogPaws!! You're making me hungry, Oz!!! Sounds pretty tasty. We've had their toppers and they are good, so I'm sure the patties are scrumptious. You made me drool a little. Jimmy and Wilson would have LOVED to test out that food! Lucky you for getting a whole month! I would probably sneak off and soak the food in water while they weren't looking, that way I wouldn't have to hear them barking! Yum! I'll be adding this to Nola's rotation. She's now almost exclusively on freeze dried raw, and loves it! Your patties straight into chunk sort of bits ahead of introducing domestic hot water. Along with of course, using Stella & Chewy’s contain tepid as well as domestic hot water (a few other makes propose frosty normal water which in turn usually takes extended) which in turn many of us come across accelerates your prep. After My spouse and i put your domestic hot water.